Fillings are used to “fill” the surface area on a tooth. This usually happens when the tooth has a decayed portion. The dentist treats this ca vity by removing the rotten or corroded area and then performs the tooth filling. This procedure is also used to repair broken or cracked teeth, as well as for teeth that have been weakened or deleted because of maltreatment or abuse like tooth grinding or nail-biting. Traditional fillings are formed into place during a patient’s dental. Composite fillings are the most modern filling to this day. 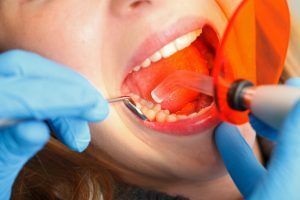 Also known as direct fillings, are made with a tooth-colored adhesive-like material and are applied to your tooth directly. It has a multifaceted composition that includes a light-sensitive element which cures to shape the hard-filling material when applying a high-powered light. Composite fillings are applied into your mouth directly, making them look extremely like natural teeth. This is the most common and recommended type of dental filling.